Send fruit and treats for the holidays. 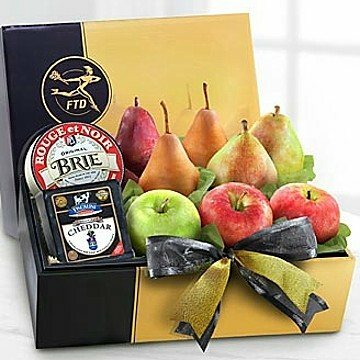 The FTD® Gourmet Fruit & Cheese Gift Box makes an exceptional gift to send in honor of any of life's special occasions! Arriving in an attractive black and gold gift box are the following gourmet goodies. Standard gift includes 2 Bosc Pears, 2 Comice Pears, 2 Braeburn Apples, 1 Red Pear, and 8-oz. Fiscalini Farmstead Cheddar Cheese. Premium gift includes 2 Bosc Pears, 2 Comice Pears, 2 Braeburn Apples, 1 Red Pear, and 8-oz. Fiscalini Farmstead Cheddar Cheese, 1 Granny Smith Apple and 8-oz. Rouge et Noir Brie Cheese, 1 additional Red Pear and 8-oz. Vella Dry Jack Cheese.